Handwashing, it's something everybody does. But do you do it often enough? Are you even doing it correctly? Read on to learn the answers to these ever important questions. As a caregiver, you should wash your hands more than the average person. This is important not only for your safety, but for the patient's as well. You could make your patient ill just as easily as they can make you ill. Washing your hands is a win-win for both of you. You should wash your hands before and after you have physical contact with your patient. Yes, even if you wear medical gloves. Think about it, you have to touch the gloves before you can put them on and what if one of them tears? You should also wash them after you go to the bathroom. Many people don't, but you shouldn't be like them especially since you are taking care of someone other than yourself. At the hospital where I work, we mainly use hand sanitizer before and after each patient since we often have so many of them. This is just another way to perform handwashing but right now, we are going to focus on using soap and water. How do you wash your hands? It is really quite simple and you should learn, if you haven't already, to do it correctly without even thinking about it. You can practice it pretty much anywhere since most places have soap and water readily available. Below are step by step instructions that show you the proper way to wash your hands in a clinical setting. I have researched the way it is to be done in order to pass the certified nursing assistant (CNA) exam to provide the most complete set of instructions. All of this may sound really easy and it is, but it's also easy to miss a step. Old habits can be hard to break, but if you stop and think of these steps the next few times you wash your hands, they will become second nature. You should perform this process with your hands over the sink the entire time, with your wrists below your elbows so water doesn't travel up your arm. 1. turn on the water faucet. A paper towel is not needed initially to turn on the faucet since it and your hands are already considered dirty. The water should be warm but not hot enough to cause discomfort or burn your hands. Do not touch any part of the sink except the faucet handles during this process. 2. Moisten your hands and wrists thoroughly for just a few seconds. 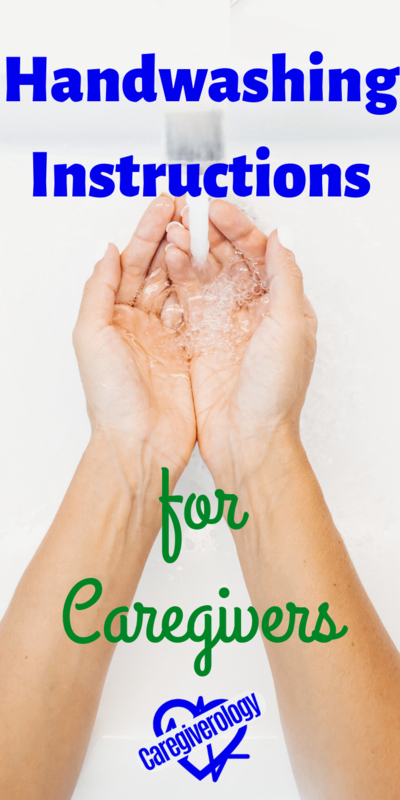 Apply enough soap to clearly see the suds surrounding your hands as you scrub. Note that the best way to be sure 20 seconds have passed is to observe a clock or wrist watch. Singing a song in your head such as "Happy Birthday" can be inaccurate if you are in a hurry or have other things on your mind. 5. After 20 seconds have passed, begin to scrub each cuticle on each finger individually. 6. Scrub the inside of your fingernails. Do this by scratching the inside of your palms on the opposite hand with each finger. Do this while keeping the fingers pointed downward until there are no more suds. Note that it is acceptable to gently clasp your hands together but do not shake your hands. This can cause water droplets to splash outside of the sink. Dry them completely with paper towels and then throw the used paper towels in the trash. Use as many as it takes to get your hands completely dry. Be sure that the paper towels do not touch below your wrists where you have not cleaned so you do not contaminate the paper towel and thus, your hands. Air dryers are not recommended because they aren't very effective at getting hands completely dry and can easily spread water droplets on your clothes and the floor. Washable towels are also not recommended because they are typically used multiple times without being washed and harbor moisture over time which can cause bacteria to grow. 9. Turn off the water. Only after your hands are completely dry, use another dry paper towel to grab the faucet and turn it off. Note that using a wet paper towel can easily tear without you realizing it and contaminate your hands all over again. Some caregivers wash their hands so much that they begin to get rough and dry, I know mine do. This is by no means an excuse to stop washing, just use lotion on your hands every now and then to moisten them back up. Washing your hands really is the first thing you should do before anything else. This whole page may seem like a waste of time but think about it. Germs too small for us to see spread so easily without anybody even realizing it until it is too late. Handwashing gets rid of those germs before they make someone ill. Infection control really is in your hands.